Innovation executives weigh in on how corporate leadership, culture and innovation structures contribute to disruption readiness. We all know the narrative of the nimble start-up that brings down industry titans. Buffeted by the disruptions springing from the intersections of technology, globalization and demographics, large corporations are too slow, too focused on the most valuable customers of the moment and too invested in incumbent systems. But what if we could flip the narrative and instead focus on what enables a large company to disrupt, to innovate a new business model that displaces the existing ones in a market? Today, the average company sits on the Fortune 500 for just 15 years. Classic disruption accounts for some of this churn. But so does the failure of some companies to meet the rising bar of financial performance that determines the benchmark’s annual reconstitution. 1980s: Intel’s turn away from commodity memory chips in favor of microprocessors under Andy Grove’s leadership. 1990s: Nokia’s decision to focus on mobile phones and cellular network infrastructure for communication service providers (CSPs). 2000s: Apple’s launch of iTunes in 2001 and the iPhone in 2007; also Netflix’s expansion into streaming media in 2007 and their entry into content creation in 2013. GE’s 2015 launch of Predix and its ongoing transformation into an industrial internet company reflect similar ambitions. The ability to create a new, disruptive business model turns upon the ability to put together new or disparate ideas, capabilities or technology. 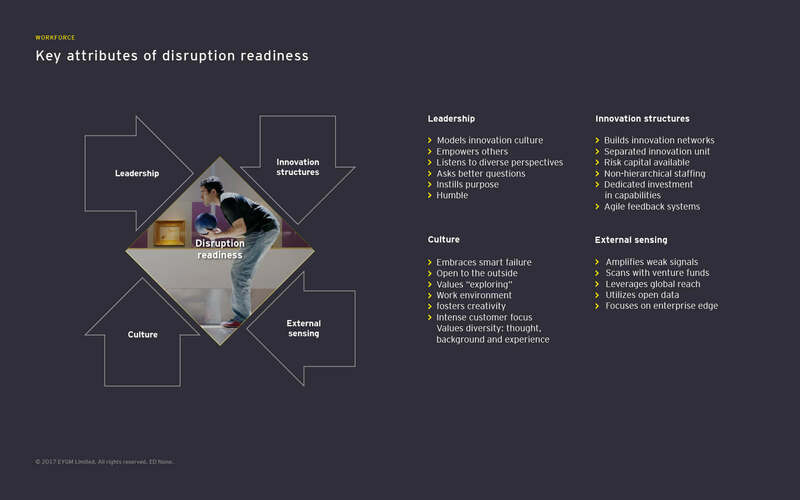 To gain insight into this question of corporate disruption readiness, we embarked on a multi-part global study—The CEO imperative: disrupt or be disrupted—that would ultimately involve over 65 hours of survey interviews with 101 CEOs of Global 5000 companies. To inform the survey content, we convened a virtual global panel of 15 chief innovation officers, academics and thought leaders on a crowdsourcing platform. Most of them hold, or have held, senior innovation positions with Global 1000 companies. We asked the panelists to consider companies such as the ones above and their own professional experiences to address the question: What are the most important organizational attributes that enable a large global company to disrupt? Given the immediate profitability pressures, legacy mindsets, established job functions and incumbent talent in most large companies, disruptive innovation is unlikely to impossible in business-as-usual circumstances. 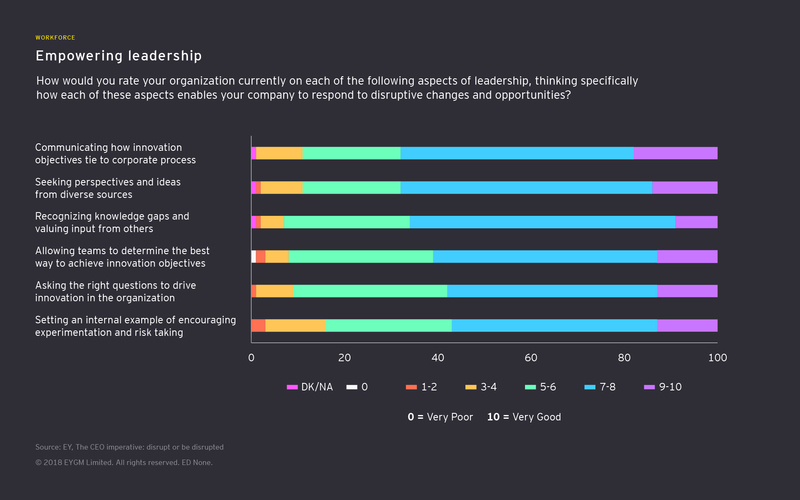 To enable a large company to escape this limiting framework, the panelists pointed to a number of attributes falling under the four major themes—leadership, culture, innovation practices and external awareness capabilities. The starting point of disruptive innovation is leadership that gives the rest of the organization the confidence to take risks and explore by advocating, celebrating and rewarding disruption efforts. 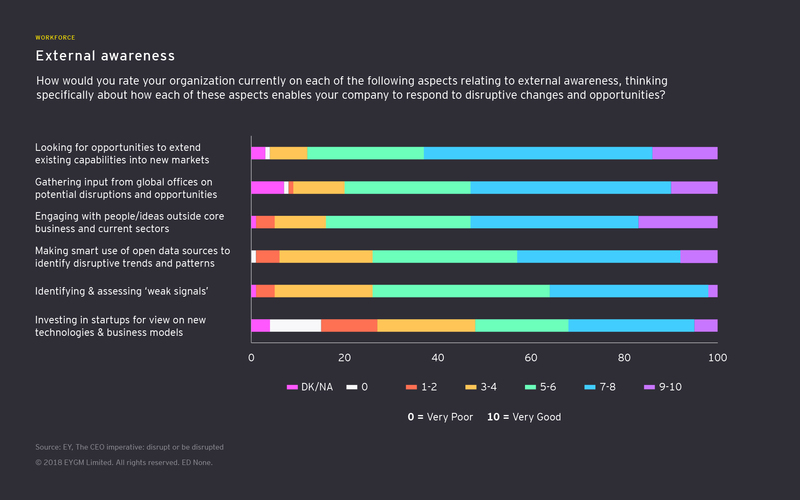 Disruption initiatives should be prioritized by giving them senior executive sponsors and empowering teams to achieve disruption objectives independently. Most importantly, in the words of one panelist, leaders must “ask the right question, and identify the questions behind the question,” to steer the organization in building the right action plans. In our survey, CEOs assign the lowest leadership scores for setting an internal example of encouraging experimentation and risk taking. This “walking the talk” is most difficult because leaders live the tension between balancing revenues with innovation that will drive real change and achieve the right business outcomes. A culture that values diversity of thought, background and life experience — in addition to the traditional definitions of diversity — is essential to the ideation and creativity that fuel disruption, according to our panelists. Openness, trust and transparency contribute to interchange and risk-taking. A commitment to treating failure as an inevitable outcome of experimentation that provides a learning opportunity enables agile product development. These attributes must be accompanied by an intense focus on listening to the customer in a highly socially networked, fast-moving global community where technology is driving transparency at all levels. In assessing specific dimensions of their corporate culture, the CEOs in our survey assign mostly high scores. They indicate that culture is top of mind and that they are devoting considerable effort to shift culture. The notable exceptions are the scores for investing in exploratory, long-term ROI projects that may not deliver a short-term return — only 43% give themselves a good or better rating in this disruption readiness attribute. This suggests that despite the work underway on culture change, there is still a gap in translating innovation cultural values into real risk taking and change from business as usual. Panelists emphasized the need to elevate the importance of the disruption unit and remove institutional obstacles by separating it from the main business. “Separate” connotes both a physical separation and different governance, goals and reporting lines. However, the disruption unit must interact with rest of the company to set the stage for integrating disruptive innovations back into the organization. The ability to create a new, disruptive business model turns upon the ability to put together new or disparate ideas, capabilities or technology. Achieving this requires getting people to think differently, together. For this reason, panelists viewed innovation network creation and orchestration as a key capability—empower people to self-identify and connect over related explorations. Similarly, it has become more difficult for companies to disrupt on their own due to industry convergence. Creating and managing business ecosystems of partners and collaborators will become an increasingly important core innovation function. “We stand no chance of success if we face disruption alone,” said one of the panelists. 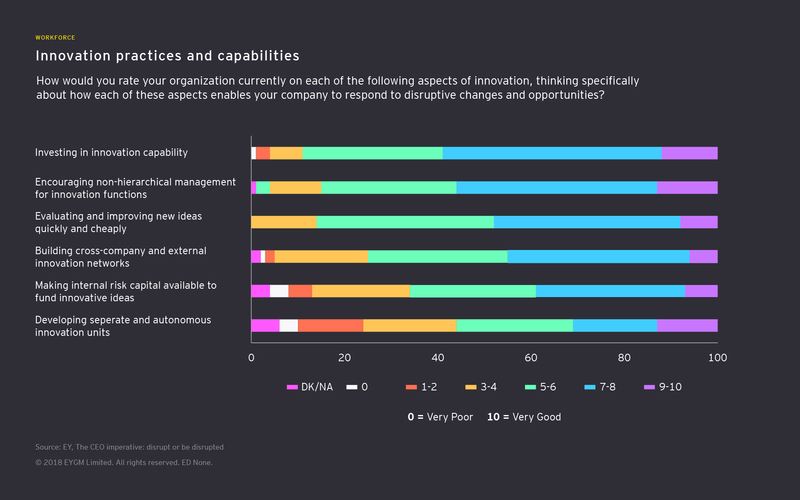 In light the prioritization by innovation executives, it is interesting that developing autonomous—or separate—innovation units represents the weakest area of disruption readiness activation, with only 31% of CEOs assigning a good or better rating. Perhaps this is to be expected, since creating autonomous innovation units requires adjusting the organizational landscape of the many functions and business units that own some dimension of innovation. The best ideas often come from companies, people or industries with different experiences, motivations, perspectives and knowledge. Which is to say, disruptive ideas and innovations are likely to come from outside your core market. To pick up on the weak signals of change and opportunity, a company must look beyond industry, geography and professional disciplines. This involves partnering beyond industry boundaries, using scenario planning, engaging with startups globally and tapping the academic world. Seek solutions beyond core competences and business lines. “The world is the innovation lab,” commented one of the panelists. The external awareness and collaboration attributes—bringing the outside in—receive some of the lowest CEO ratings. Only 36% of CEOs give themselves a good or better rating for identifying and assessing weak signals that could serve as signs of new trends. And only 33% gave their companies a good or better rating for investing in start-ups to gain a view of new technologies and business models. This dimension of disruption readiness demands that CEOs reach beyond the boundaries of the organization and their comfort zone. It also requires a significant investment in time and resources to look ahead toward an uncertain future when most organizations are focused on activities with certain and immediate returns. Our panelists underscored that it's hard to set out to disrupt your business model and that the timeframe is long and unpredictable. Most innovations turn out to be sustaining or incremental. Even disruptive innovations are usually the result of years of experimentation and iteration to make them market ready and aligned to a large market. Rather than setting an explicit goal of disruption, stay focused on looking ahead and the customers’ deepest need. Our innovation executive panel reaffirmed the value of the core innovation toolset. Concepts such as diversity, networks, open innovation, ecosystems, empowerment and special incubation structures remain essential. However, the business context has transformed. The world is now massively connected. Digital transformations are dissolving industry boundaries. Ideas are the new unit of value. As a result, corporations must flex the tools and concepts of innovation in new directions, deploy them faster and drive them throughout the organization, leveraging technologies such as crowdsourcing and open platforms. Be the disruptive company. Disruption is a transformational journey that involves activating the organizational attributes that enable the exploration, risk-taking and innovation needed to seize the upsides. Disruption starts at the top. The CEO must give license to the organization to be disruptive, by personally modeling disruptive values and supporting the broader set of disruption-readiness attributes. Have a dual strategy. Businesses must have a strategy to both initiate and responding to disruption—simultaneously. Culture and talent trumps strategy. Disruption depends on developing the culture that attracts, retains and empowers the talent capable of both operating the existing business model and disrupting it. Symphony, not solo. As companies — and the sectors they operate in — become more porous to the outside, the ability to orchestrate innovation networks and ecosystem partners becomes a disruptive differentiator. To navigate through digital disruption, organizations need to flex the tools and concepts of innovation in new directions.